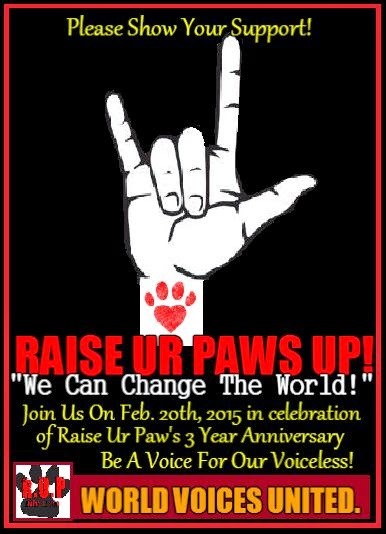 RAISE UR PAW NEWS: RAISE UR PAWS UP WORLDWIDE - "We Can Change The World"
RAISE UR PAWS UP WORLDWIDE - "We Can Change The World"
On Feb.20th, 2015, We at RAISE UR PAW, a not-for-profit incorporation, will be celebrating our 3 year anniversary, and what better way to celebrate, by uniting the world as one to RAISE THEIR PAWS WORLDWIDE for animals in need. RAISE UR PAW WORLDWIDE campaign is aiming to raise the paws of the world, to not only show the countless individuals that speak out and stand up for our innocent animals worldwide each day, but to also raise awareness on the issues that our voiceless endure and subjected too on a daily basis. When you Raise Ur Paw, it is more than just a statement – it is a message of hope that together we can find a solution and work together to protect and save the millions of lives that are needing our aid and support continuously. We are truly hoping that this campaign will reach every heart and voice of each individual around the globe, to unite us all as one clear, strong and powerful voice for the innocent. On Feb. 20th, 2015 Please take a moment of your time to show your support and RAISE UR PAW – whether it be a simple statement, or a photo of yourself raising your paw high – every voice counts and every heart needed to show animals that we care. PLEASE SHARE WITH ALL YOUR FRIENDS, FAMILY, SUPPORTERS and LET’S COME TOGETHER AS ONE.